Why do I care so much about poverty? Those of you who know me will be aware that finding solutions to tackling poverty has been one of my burning priorities ever since I first entered politics. But above all else, I’ve gone out of my way to promote innovative, community led charity projects that are sprout from the ground up rather than the top down. I think it’s these small charities that are often the most effective. Not only are they often close to the action, drawing on a small pool of dedicated and passionate volunteers and leaders, but they can also often better allocate their resources to really fixing problems. On one hand, huge strides have been made in tackling poverty since the 1980s. In 1981, a staggering 42% of the world’s population were categorised as being “extremely poor”. By 2017, that had dropped to 9%. But just because absolute poverty is on the verge of extinction, it does not mean there aren’t still some huge challenges facing us. Meanwhile, in the UK, we have the well-publicised challenges over the rollout of the Universal credit. While it’s clear that some of these are exacerbated by teething problems with the rollout, charities such as Citizens Advice have shown that charities can play a key role on the ground with helping to guide those in need through the sometimes complex system. Perhaps more concerning than the big headline grabbing incidents like the Universal Credit roll-out, however, is the growing divide in social mobility. What we’re increasingly seeing is “clusters” of opportunity in a handful of areas, while children in other areas are increasingly at risk of being left behind and deprived of life opportunities. This was highlighted vividly in a recent study by the Social Mobility Commission, which highlighted the extent of the postcode lottery that often ends up being a major determinant of how far children go on to progress in life. It’s with this in mind that I’ve convened a Global Poverty Summit on January 26th. 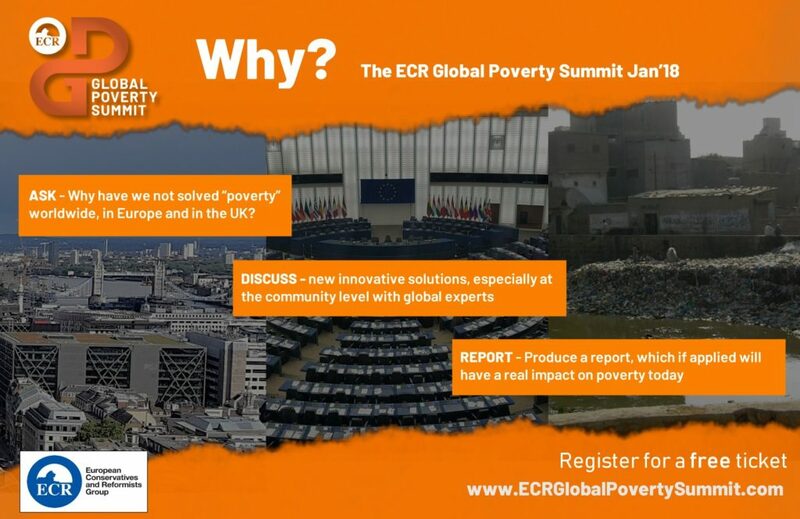 The ECR Global Poverty Summit will bring together some of the world’s most prominent figures in the area, inviting thought leaders from business, government, academia and the not-for-profit sector to address the conference. The Summit’s aim is simple. To come up with a report that – once published – will provide clearly defined action steps for community organisations, philanthropists and others that wish to tackle poverty and exclusion in their local communities in order to reduce poverty in Europe and around the world. Keynote speeches, case studies, and moderated discussions will provide participants with key insights into the latest thinking, as well as challenge ideas that need updating and suggest new ways to tackle poverty in the 21st century. I hope and believe that this conference can fire the starting gun on some innovative new ways of tackling poverty by bringing people together in one place to share and hear good practice from across Europe. While we should all be proud of the prosperity free markets have helped spread, we can’t rest on our laurels. If we don’t talk about how we support community organisations that help give people a leg up and get them on the ladder of opportunity, we risk support for free markets being diminished as a consequence of people failing to see how it benefits them. I hope you’ll join me to be a part of this important discussion.